AB’s St. Louis facility is located in a new commercial center designed for research and development labs. The lab is a state-of-the-art Research and Development Center where a broad spectrum of processed cheese products can be manufactured and evaluated. AB has the ability to evaluate all types of raw material for its physical attributes and functionality in regard to processed cheese applications. AB is also associated with the Danforth Plant Science Center that gives the Company access to new technologies in plant- based ingredients. Customer visits are welcomed for trials and testing at any time. 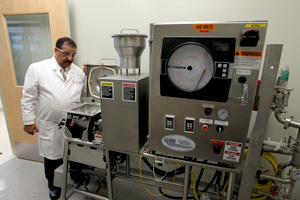 AB’s Keokuk laboratory is a first class Bakery Research & Development Center. And it is here that AB focuses on the two major areas of its bakery business: breads and tortillas. This facility has all the equipment necessary to make and evaluate almost any kind of bread product from pretzels to whole wheat loaves. 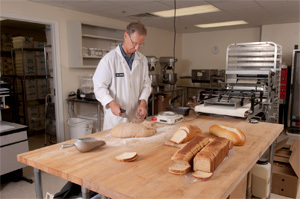 In this lab, we develop and evaluate conditioner bakery blends for all types of applications. We can also make and evaluate any kind of tortilla formulation. Customer visits are always welcomed for trials and testing. AB’s Tortilla Innovation Center resides in its Bell, CA facility. This includes a full tortilla manufacturing line. 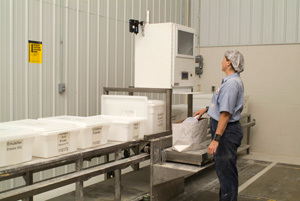 From mixer to cooling conveyor line, this facility does it all. AB evaluates tortilla formulations in an actual manufacturing setting, producing finished tortillas that are ready to eat and evaluate. AB is fully equipped to evaluate the finished products as well as the base tortilla blends. Again, we welcome customer visits for trials and testing at any time.